Hance Park opened in 1992 using it's full name, Margaret T. Hance Park. It is a 32-acre urban park in downtown Phoenix. It was named for Margaret Hance, who served four terms as the Mayor of the City of Phoenix (1976 - 1983). She passed away in 1990. Hance Park is also referred to as the "Deck Park" or the "Margaret T. Hance Deck Park" because it sits on top of (on the deck of) the tunnel that serves as an underpass on I-10 from 3rd Street to 3rd Avenue. Margaret T. Hance Park is the site for various annual festivals in Phoenix. It is adjacent to the Japanese Friendship Garden, Irish Cultural Center, and the Phoenix Center for the Arts. Across Central Avenue is the Phoenix main library, the Burton Barr Central Library. The Hance Park Dog Park is located on the west side of the park. Not far from the downtown core, here are estimated driving times and distances from various parts of the Valley of the Sun and beyond. 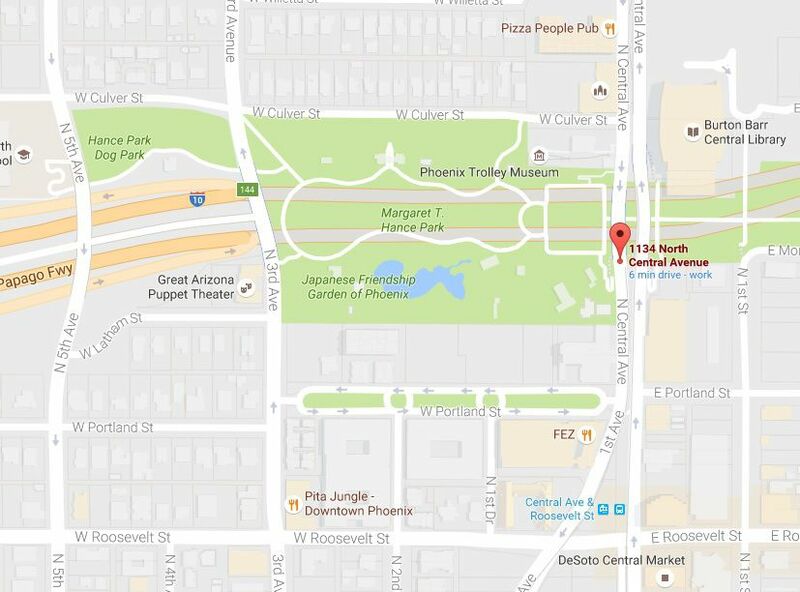 The Margaret T. Hance Park is located at Central Avenue and Culver Street in Phoenix. Culver is between Roosevelt Street and McDowell Road. From West Phoenix: Take I-10 East towards Tucson. Exit at 7th Avenue. At the top of the exit ramp, turn left (north) on to 7th Avenue. Immediately after coming onto 7th Avenue take the first right turn, which is Culver. The Margaret T. Hance Park is on your right. From East Valley: Take I-10 and stay on it. Drive through the Deck Park tunnel. In the tunnel, which begins after the 7th Street exit, move to the right lane and take the first exit, 7th Avenue. It will be the first exit after you leave the tunnel. At the top of the exit ramp turn right (north) on to 7th Avenue. Immediately after turning onto 7th Avenue, take the first right which is Culver. The Margaret T. Hance Park is on your right. From Northwest Phoenix/Glendale: Take I-17 South or the Loop 101 South to I-10 East towards Tucson. Exit at 7th Avenue. At the top of the exit ramp, turn left (north) on to 7th Avenue. Immediately after turning onto 7th Avenue take the first right turn, which is Culver. The Margaret T. Hance Park is on your right. The park is accessible by Valley Metro Rail. Use the Central / Roosevelt Station.